A fast growing, dense shrub with glossy green leaves and white flower spikes in the spring. It is very adaptable. It takes shade to full sun with a moist, well-drained, acidic soil. 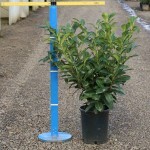 This is a good plant for hedging; it will respond to shearing.